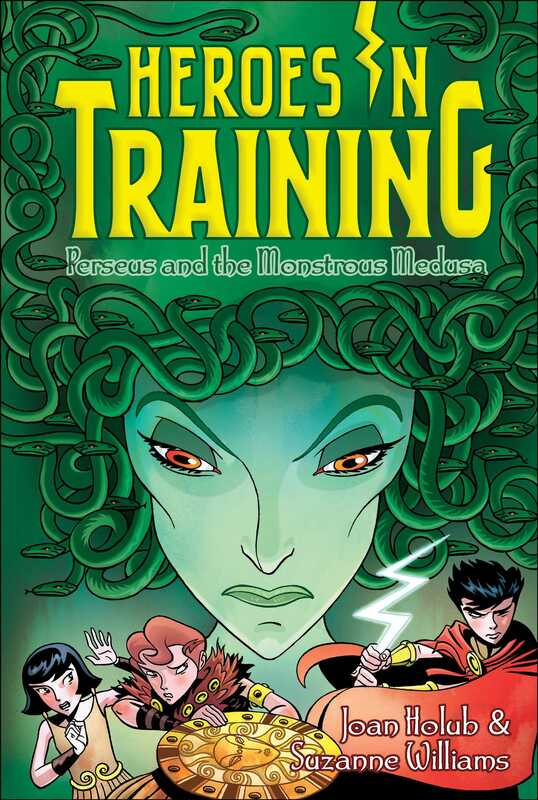 Perseus and the Olympians face off against the Monstrous Medusa in this Heroes in Training adventure. “The hairy snakes, the hairy snakes! We’ll find them soon, make no mistake. But will they have hair, cute and curly? Or hair that’s wild and whirly twirly? I wonder if it’s short and neat? Zeus, the black-haired, blue-eyed leader of the group, sighed in annoyance. Apollo had been singing about the Olympians’ current quest for the last two miles. “Will you please stop singing that song?” Zeus asked him. “Yeah, snakes don’t have long hair. Or feet,” Hera scoffed. She and Zeus’s two other sisters, Demeter and Hestia, were walking right behind Zeus, Apollo, and gray-eyed Athena. Zeus’s brothers, Hades and Poseidon, trooped side by side a little ways back of them. Ares, who came next with the blond and beautiful Aphrodite, waved his spear. “I hope they’re giant, hairy jungle snakes! That would be a great fight!” The god of war’s red eyes shone at the thought. Zeus shuddered. In his humble opinion, there’d been far too much fighting during all their other quests. As leader of the Olympians, he felt it was his duty to help them avoid fights whenever possible. Unfortunately they didn’t always have that choice. “Let’s just hope they’re not poisonous snakes,” called out Artemis, who was Apollo’s twin sister. With a golden bow and a quiver of silver arrows slung across her back, she was marching alongside her brother. “I bet I could make a mechanical snake,” mused Hephaestus as he struggled to keep pace with the others. He’d crafted the cool silver cane that helped him walk. It was carved with wicked-looking skulls. He was a genius when it came to crafting mechanical metal machinery, tools, and creatures. “We’re Olympians!” cried Poseidon, whose eyes were as turquoise as the sea. “We have no home—not until we defeat King Cronus and the other Titans.” Titans were giants as tall as oak trees. It was from Pythia, the Oracle at Delphi—who could see the future but not always clearly—that the Olympians had learned their destiny. Which was to save Greece from evil Cronus and the cruel Titans. Then the Olympians would rule in King Cronus’s place. And it was also from Pythia that Zeus had found out he was destined to become the ruler of everyone. The number one guy in charge. At the moment, though, Zeus would gladly have let someone else take charge. And not just because he didn’t want another fight on his hands. No. He could handle another fight if he had to . . . as long as it didn’t involve snakes. Especially hairy, scary, and possibly poisonous ones. He had faced enemies as tall as mountains, but snakes? He shuddered. “Let me just say that when we are finally done with all our quests and have defeated our enemies, I plan to ban snakes!” Zeus declared. She wasn’t just teasing. It was true. Pretty Aphrodite had risen from the ocean the day before on a mound of bubbles. There were still a lot of things she didn’t know about the world. “Can we please talk about something else?” Zeus pleaded. “Ooh, Boltbrain is afraid of snakes,” Hera teased in a singsong voice. Usually Zeus could put up with her teasing, but not about this. “Just forget it!” He stomped ahead of the group and kept on marching. The path they were on wound along the top of a ridge. Down below, he could see ocean waves lapping against the sandy shore. “Well, it’s about the aegis,” she said. She opened the front of her cloak to reveal the shiny, gold shield she wore over her chest. Decorated with gold studs, the aegis was a magical object. Hera had found it in a Titan’s house, and Pythia said it belonged to both Zeus and Athena. “You know that image that appears on the aegis sometimes? The one that turned the spiders into stone?” Athena asked. Zeus nodded. Sometimes the face of a terrifying woman with snakes on her head appeared on the shield. That image had recently scared off some spiders that had wanted to munch the Olympians for dinner. Zeus stopped walking as something dawned on him. “Hey! The woman on that shield! You think she could be real? You think her snakes are the ones Pythia meant us to find?” he asked Athena. The rest of the Olympians had caught up to Athena and him and were all listening now.